This special episode features Dr. Marc Brasof of Arcadia University. Marc Brasof is an Assistant Professor of Education in the School of Education at Arcadia University. Dr. Brasof serves as the Director of Secondary Social Studies and English Education. You can read his latest book, Student Voice and School Governance: Distributing Leadership to Youth and Adults, or see other writings here. Dr. Brasof can be reached at twitter: @brasof or by email:brasofm@arcadia.edu. This episode features Dr. Dana Mitra of the Penn State Univeristy and Kaden Litzinger, a student at Delta High School in Pennsylvania. Dr. Dana L. Mitra is Professor and Director of Graduate Studies in the Department of Education Policy Studies at the Pennsylvania State University and Kaden Litzinger’s mom. She is the founding editor of the International Journal of Student Voice. Dana has authored over 30 articles on student voice and two books on student voice. Kaden Litzinger is a ninth grade student at Delta High School in State College, Pennsylvania—a public, democratic school. She has participated in two International Conference on Student Voice in Dublin Ireland and Burlington, Vermont. She is also active in Quaker youth conferences through the Baltimore Yearly Meeting. International Journal of Student Voice: Please consider contributing if you are a student, student voice researcher, practitioner or youth advocate. Amidst the hullabaloo of attention towards the American presidential election, it is worth drawing a share of the focus to a systemic, but nonetheless spicy political issue, one that involves positions of power, outsiders, and serious stakes- student governments. The positions of power are student councils and student trustees, the political outsiders are, self-evidently, students themselves, and the stakes are the potential for dramatically improved educational outcomes. I admire the work of past and current student leaders, but the similarity in the roles, mandates, and activities is precisely the point: where is the student voice? Organizing fundraisers and social functions doubtless provide a valuable service, but this can be considered as extra-curricular. The political practice we should be talking about is precisely that student government, with changes in teaching and learning, as well as technology, can justifiably and viably have voice in the broader administration of the school, to the mutual benefit of teachers, administers and pupil. When students are able to be directly involved in decisions surrounding not just playtime, but policy, democracy will seem exciting for the best reasons. The legitimacy of student voice, which means a role beyond tokenism, it is worth remembering Ontario has already legislated that each school board has student trustees. We must wonder, what resources are afforded, but more importantly, how are these resources actually used in the current practice of student government at school, board, and provincial levels? How are all voices being included? What is the evidence of return on investment? What is being done in civics classes to energize this student voice? There are best practices, and these must be made known. From voting on issues, not people, to choosing course offerings, building improvements, and co-op programs, students have incredible ideas. We must foster their untainted wisdom, for the laboratory of democracy that are student councils and senates, in the authentic representation of all students, ought to be, through the practice of civic engagement, the most exciting incubator of student potential. Talk of revolution is often cheap, but small obvious reforms can have revolutionary benefits. So the real trump card, naturally, is that future leaders, all students, experience the benefits of an inclusive democratic process in their schools–It’s about time we used it. The SoundOut Student Voice Podcast explores what students are doing to transform schools, learning and education around the world, featuring news, stories, tips, tools and more! 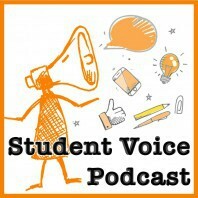 Help the SoundOut Student Voice Podcast grow by sharing it with others. Comment on our website or send an email to podcast@soundout.org. SoundOut is a program of CommonAction, an education consulting firm located in Olympia, Washington. All content ©2016 SoundOut. All rights reserved. For more information, including permissions, booking, sponsorships and more, please contact us.